The time for modesty is over as Getintothis’ Matthew Wood combines the cream of the crop into a bite-size Top 10. 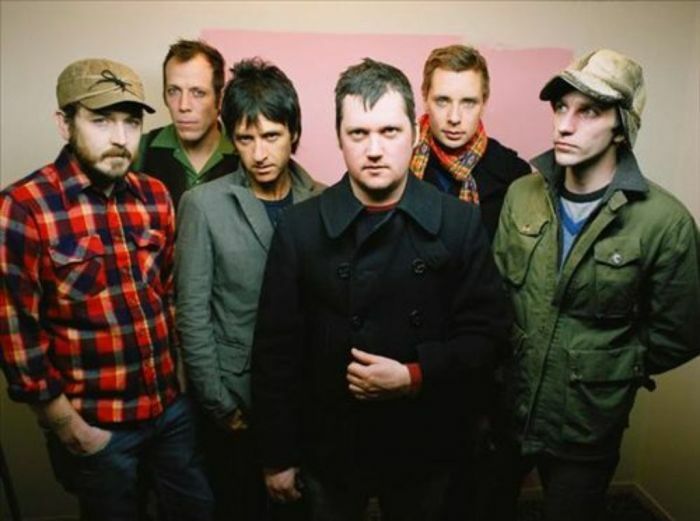 Formed in 1993 in Issaquah, Washington by Isaac Brock (Vocals/Guitar), Jeremiah Green (Drums) and Eric Judy (Bass), Modest Mouse return with their latest album Strangers to Ourselves, their first for eight years. Their career began with a 7 minute EP titled Blue Cadet-3, Do You Connect? released on K Records in 1994, offering an already well-defined sound that would remain at the heart of their later projects. The band’s first full-length outing came in the form of This Is A Long Drive for Someone with Nothing To Think About, produced by the legendary Seasick Steve. An album that toys with influence, from the Boise, Idaho sound of Treepeople and Halo Benders, to the surf rock influence of the Pixies. From this point onwards Modest Mouse only gained momentum and led to arguably one of the greatest American alternative rock albums of a generation: The Lonesome Crowded West. Refining earlier explorations adding perhaps a more accessible aspect to their melodies, aided by Brock’s ever-growing vocal versatility, a masterpiece was born. The acquisition of Johnny Marr for We Were Dead Before the Ship Even Sank in 2007 only furthered the band’s success and fifteen years since their formation cemented their legend with arguably their catchiest record to date. With the new album out last week the verdicts are beginning to come in, but if there’s one thing we know about Modest Mouse it’s that they place great emphasis on musical journeys, providing no road map, we can only speculate where this one may take us. Transporting us to the front seat of the Modest Mouse tour bus we pass bear tree branches, railway lines and pastel painted wood cabins, all the while Mount Baker gleams in the distance as we throw pills down our throats. A bending, recurring riff winds like a road map while quivering harmonics echo sirens and squeaky brakes. Hurtling across the globe is, as the album title suggests, a key theme, and this track tenderly eases us into the journey ahead. Guitarists Dann Gallucci and Eric Judy create a twinkling backdrop allowing Brock to encrust their riffs riff with philosophical jewels, inducing a pensive state, urging us to ponder our past, question the present and wonder where the hell we’ll end up. Pulled together by a clever intertwining of backing vocals and chord organ melody the track stands as an outstanding piece of song writing. Adding such a synergist as Johnny Marr to the line up could have struck fear into those who crave vintage Modest Mouse but needless to say, bands must progress. Thankfully, Marr’s influence was not one that diluted the rest of the band, but seemed to push them into unexplored regions. Often considered over-indulgent with its cinematic use of string and horn sections, the track is coated in a thick layer of success, but remains faithful to the core elements of the band. Entering this track you can almost picture a dusty, leather-skinned version of yourself, chewing on tobacco with your hands poised either side of your holsters. A riff that sets a dusty scene like no other, pausing briefly to paint a ponderous, pastoral picture, sandwiched between our drunken protagonist Cowboy Dan starting wars and shooting his rifle at God. Surging combinations of ride driven drumbeats, angular bass lines and a rip-roaring riff collide in a way that is potentially chaotic, but the band remain in absolute control. Hectic, exhilarating and characteristically lyrically witty: “I wanna remember, to remember, to forget you forgot me”, riddles Brock, soaked in shuddering effects. Teeming with powerful, unforgettable delay-drenched riffs and an existential lyrical resonance, the band really pulls out the stops for this one. The exquisite use of vocal layering with Brock’s powerful ‘WELL THAT IS THAT AND THIS IS THIS’, coupled with softer, lisp-y backing vocals, insure Brock’s hope for an afterlife strikes you on a number of levels. For anyone who’s idea of fun goes hand in hand with debauchery and the ‘just one more’ mentality, then the title of this song will ring true more than any other. Soothing panpipes swirl between cymbal chokes as the band chime the chorus in epiphanic fashion. An extremely simple track that proves even the most repetitive riff and chord sequence can take you a sheer number of places. A comment on the monotony and listlessness of life, “I’m going nowhere but I’m guaranteed to be late” muses Brock, backed elegantly by Nicole Johnson, of whom little is known. A surging, spiraling bass-line and rough, thrashing drum fills end the track in an almost frustrated manner, eager to break free from the relentless interstate. Innocence runs thick in the veins of this track, with a simplistic, scratchy intro before Brock proceeds to define ages of existence; eating with plastic forks, a long divorce and high school nerves all eloquently referenced. On the whole, a lyrical treat, that rises and falls before ascending into an explosive jam in typical Modest Mouse fashion. Arguably one of the most epic, soul stirring tracks in their discography, another rip roaring riff with elements of Shepard tone, ascending higher and higher before falling sharply yet gracefully into the acoustic origins of the track. A sense of reward and sanguinity resounds from the closing stages of the track, embellished with a smooth horn section and marching snare rolls while Brock’s “Cheer up baby” floats optimistically around your head.